When it comes to entertaining, size really doesn't matter. If you've been reluctant to have guests in your Springs luxury studio apartment, use these tips to host a bash that people will remember long after it's over. Careful planning lets you make the most of your space and avoid awkward situations, but don't obsess about it. Nobody's perfect, and your guests will have so much fun they won't notice any minor glitches. Large parties can mean a shoestring budget. When you entertain a more select group, you can splurge on special touches like gift bags and designer invitations. Don't be reluctant to move furniture and other items around to maximize space. Push things up against the wall or stash them in a closet or under the bed. After all, it's only temporary! Tossing coats on the bed is an easy solution, but it takes up valuable space that is already at a premium. Clear out some room in a closet or use hangers to turn a shower rod into an impromptu coat storage. Decorations can swallow up a room, so keep it simple. Create a captivating ambiance with special lighting like candles or string lights, or place vases of colorful flowers strategically around your home. Look at furnishings and accessories with an eye toward making them serve double duty. For example, a stylish cloth draped over a coffee table turns it into a serving area or a dining surface for a "picnic." Storage ottomans and large pillows are everyday items that can be pressed into service as additional seating. Prepare as much food as possible ahead of time. It's easier to cook when you don't have to maneuver around your guests. When it comes to convenience, appetizers and finger foods are the clear winner, but you can also put together an intimate dinner party for four to six people. Stage food and drink stations in different areas to prevent bottlenecks. If you can't swing a full-out dinner but feel uncomfortable serving only appetizers, consider a combo party. Head out to a restaurant and host the pre- or post-dinner festivities at your apartment. Stocking a full bar can be expensive and cumbersome, so consider serving a signature drink that can be prepared ahead and served in a pitcher. Supplement with beer and a couple bottles of wine. 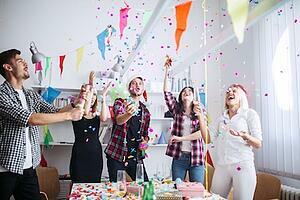 Are you a party-planning pro? Share your secrets in the comments!